1 of 3 Heat 1 tablespoon oil in a large skillet over medium-high heat. Cook fennel 6 minutes, stirring, or until browned; remove from skillet. 2 of 3 Add 1 tablespoon oil to skillet; stir in onion; cook for 2 minutes. Add garlic, rosemary, oregano, thyme, salt and pepper; cook 1 minute. Stir in flour until onions are coated. Add wine and boil 2 minutes. Add the broth and tomatoes; simmer for 5 minutes. 3 of 3 Coat slow cooker bowl with remaining 2 tablespoons oil. 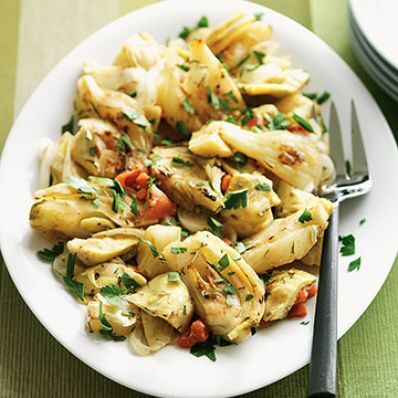 Layer half the fennel slices on the bottom, then half the artichokes, then half the onion mixture. Repeat the layers. Cover; cook on HIGH for 3 hours or on LOW for 6 hours. Sprinkle with parsley and serve.